Carbondale Police Chief Jon Reed announces his resignation at the city council meeting April 18. 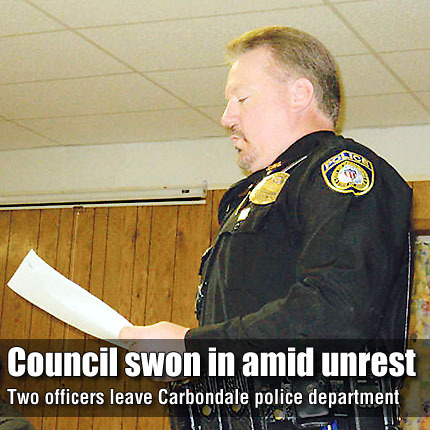 CARBONDALE—New Carbondale City Council members were immediately confronted with issues in the police department before they could be sworn in last week. Just as the April 18 council meeting began, the police chief resigned, a part-time officer was fired and another officer was appointed as acting chief. Prior to newly elected council members Ashton Traphagan and Alex Zerbe being sworn into office that night, the council convened a closed session meeting as the night’s business was gearing up to start.